A tsunami following a volcanic eruption hits the Sunda Strait between Java and Sumatra islands of Indonesia without any early warning causing heavy damage to the holiday makers and residents of coastal areas. The tsunami was caused by an underwater landslide when a chunk of the volcanic Anak Krakatau island slipped into the ocean. It was triggered by a volcano rather than earthquake due to which early warning could not be generated. Indonesia does not have an early warning system for landslides or volcanic eruptions. It was announced by Indonesia’s Disaster agency said that it will have to create a new tsunami early warning system. In the tsunami, more than 383 people were killed, thousands were injured (1200 people's) and many buildings were heavily damaged. Indonesia lies on the Pacific ring of fire. This makes Indonesia vulnerable to earthquakes. 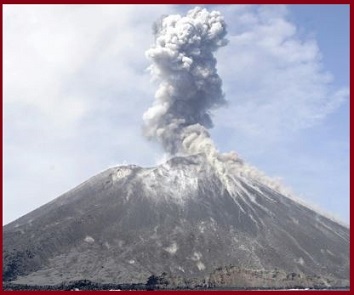 Indonesia also houses 127 active volcanoes and one of these volcanoes is the Anak Krakatau. Anak Krakatau is a volcanic island formed in 1927 after the Krakatoa volcano eruption. Ring of Fire is an area in the Pacific Ocean where earthquakes and volcanic eruptions are frequent. The Ring of Fire is a direct result of the movement and collisions of lithospheric plates of the earth.